Art of Transport: How they build bridges in China. The reality is that the millions of Los Angeles households could not retain their standard of living if they rode transit, much less walked or cycled. Many more would be in poverty. People will choose transit (and walking and cycling) only if the travel times and geographical coverage are competitive with driving. Moreover, there is no point in delusions about radical land use transformations, especially where governments require the consent of the governed. In short, there is no roadmap to any transit utopia connecting sufficient dots, because none are feasible. I don’t think any of this is necessarily wrong. I think it’s the kind of paragraph aimed directly at people and transit enthusiasts — largely outside the agency — who think the transit system is a replacement for cars. Attentive Source readers know that the capacity of our regional road system is huge and transit expansion really can’t replace that and isn’t pretending to. Is this or ridership declines reasons not to expand transit in Los Angeles County? Heck no. As I’ve said before, putting all our transportation eggs in the driving basket doesn’t strike me as smart. There should be a good alternative to driving — a strategy embraced by many major cities across the globe — and one that we’re pursuing here. As for the ridership declines, there is work underway to make transit more appealing. Needed repair work is underway or upcoming (see this post on the Blue Line). The studies to restructure the Metro bus system is also in progress. Security on the Metro system has been beefed up — a response to something riders and ex-riders complained about. Research is under way on supercapacitors that can hold longer charges than lithium ion batteries. That could make electric cars — and buses — more convenient, rather than having to pull both out of service while being juiced. New Yorkers are rightly outraged after the children — a one-year-old boy and four-year-old girl — were killed and their pregnant mother was critically injured by a woman that ran a red light and struck them in a crosswalk. The woman has not been charged with a crime. Records indicate the car she was driving in the last two years had been caught speeding around schools four times and another four times was caught running red lights. But police say the woman who killed the children had a clean driving record and believe that she had a seizure while driving. Of course, this is the kind of story that resonates in many places, including L.A. where pedestrian deaths increased in the past two years even while the city has been working to make streets safer. Oh dear. If you’re looking for a PR crisis communications exercise, look no further. The hindside of a Cincy streetcar. Photo by Steve Hymon. A rendering of the L.A. streetcar. Nice colors! 🙂 Credit: Los Angeles Streetcar. 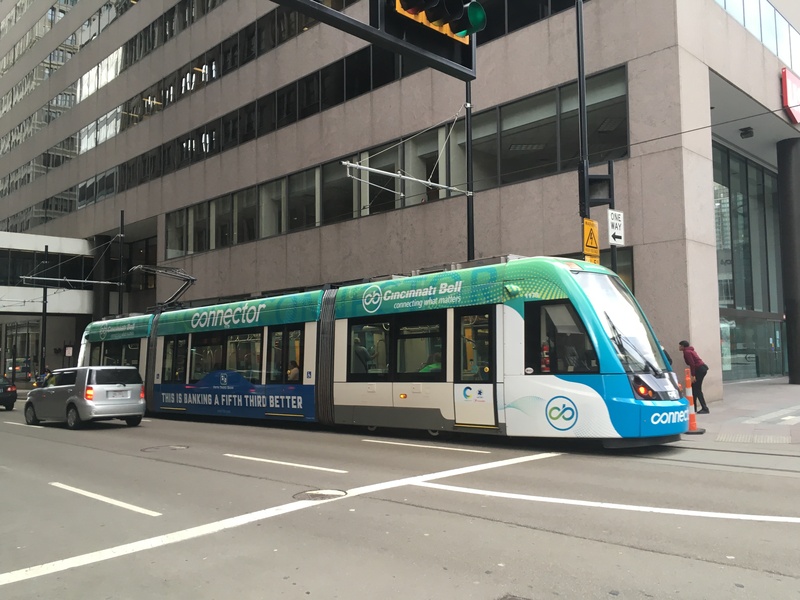 Ridership is down, the streetcar literally can’t run in cold weather, there is an ongoing dispute with the streetcar manufacturer and folks are upset that Kansas City’s downtown streetcar has proved very popular while the downtown Cincy version is not so popular. Yeah, my exile to Cincinnati for parents issues continues (although there’s an end in sight). I’m stuck in the distant ‘burbs north of town, but I’ve made a few excursions to DTCI and it’s kind of obvious the Cincy streetcar is a solution in search of a problem. A route connecting downtown to the University of Cincinnati, the many hospitals in Clifton and Xavier University would have cost a ton more, but probably would have attracted more riders and perhaps convinced a few Queen City denizens to forgo their cars (something they are very reluctant to do). The existing route is pretty easily traveled by foot. In the cosmic scheme of things, the bigger story here is that cities across the U.S. have been racing to install streetcar systems after the successes of the system in Portland. I think it’s fair to say that results in the U.S. have been pretty mixed and the streetcars are more economic development tool than transit tool. Los Angeles has a system on the docket that is set to receive $200 million in Measure M funds with a groundbreaking scheduled for 2053. The city of L.A. has been exploring options for accelerating the project. Below is a map of the route. Given the number of people working, living and playing in DTLA, I think a streetcar here will snag riders. I also think the route shifted a mile to the east — to the Industrial and Arts districts — would perform well once those areas are fully developed. Discuss please. With regards to the DTLA streetcar, I absolutely believe that expanding the route to the east to the Arts District would make it considerably more useful. As it is, it travels a fairly parallel route to the Red/Purple line and only barely expands on the coverage area of DTLA transit. Even if they reversed the direction of the loop, I think it would be more useful. Surely more people would ride the streetcar from 7th/Metro to LA Live/Convention Center/South Park if the streetcar went more directly there instead of having to either walk further to a station or ride almost the entire loop. Expanding the route to the Arts District would be even better since that part of downtown is currently underserved by transit (it has rail connections in the north near Little Tokyo, but extremely limited DASH bus service that doesn’t run on weekends, when many people would use it to get around the area). There is also an east-west connection through the area that could serve the Fashion/Garment districts by expanding the route. Once the Regional Connector is done, there will be plenty of service to the Civic Center/Bunker Hill areas, that I feel like we need to fully rethink the streetcar route to more East/West and less North/South. 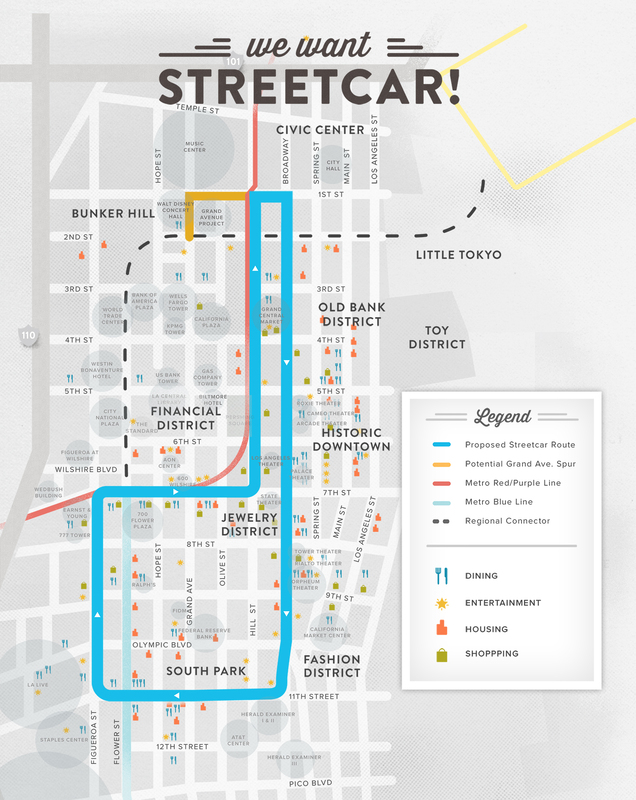 I like the idea of a street car coming to DTLA :). I say it would be a good idea to have it run in both directions (like the Blue line for example). I understand if the issue would be trying to accommodate the necessary lane space for both tracks if such is to be the case. I just don’t see a high Ridership demand for the streetcar if it’ll only circulate/travel in 1 direction only. Is LADOT the future operators of the downtown streetcar? What possible advantage does a streetcar have over a bus on the exact same route? None that I can see. For example, each can have a dedicated route and dedicated lane of travel, each could be given priority at signals, etc. Conversely, a bus (without tracks or overhead caternary wires–and again, on the exact same route) has TREMENDOUS advantages over streetcars: being able to move between lanes AND ALSO even to switch streets–easily and as necessary–whenever there is a traffic accident or anything else that blocks traffic on a dedicated lane or even on an entire street, OR whenever transit planners (or law enforcement) decide that a change to the original route is needed (whether a temporary–say for a parade/demonstration–or permanent change of route). What am I missing–or is it the streetcar advocates who are missing such problems? I really don’t think LA needs a streetcar. I’m not educated entirely on the proposal, but I know from reading The Source and other publications that Metro’s at-grade rights-of-way (aka Flower St.) are very congested and are frustrating for drivers. Not only that, but drivers in southern California do not know how to operate cars in mixed traffic with rail vehicles: a prime example is the San Diego Trolley LRT in my hometown: drivers often hit or are hit by trains, not realizing they cannot stop as quickly as another car. Are the LADOT DASH, Metro bus, light and heavy rail lines, and other existing transportation services not sufficient? Would the streetcar serving the Artist District solve the problem for providing transportation to the area? Maybe finding funding to speed up the construction of the project could happen with the Artist District in play. The streetcar doesn’t count as rapid transportation. The time it would take to get from the arts District to the Financial Core would be equivalent to a bus. If money weren’t an issue, extending the Purple Line would be the ideal solution.